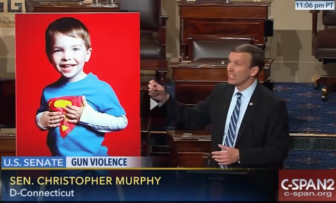 Sen. Chris Murphy displays a poster of Newtown shooting victim Dylan Hockley as he comes to the end of his filibuster on the Senate floor last year prompted by the shootings at the Pulse nightclub in Orlando. Washington – Connecticut Democrats were among the first to renew calls for Congress to act on gun control after a mass shooting in Las Vegas late Sunday left at least 59 dead and more than 500 wounded. The attack by a lone suspect, Stephen Paddock, 64, considered the deadliest mass shooting in modern American history, fueled a new round of calls for stricter federal gun control measures, pitting those who want more restrictions in place against staunch defenders of Americans’ right to carry firearms. “It has been barely a year since what was previously the largest mass shooting in American history – the deadly attack at Pulse nightclub in Orlando. In the interim, thousands more have been lost to the daily, ruthless toll of gun violence. Still, Congress refuses to act,” Blumenthal said. Since the massacre of 20 first-graders and six educators in Newtown in December of 2012, Connecticut’s lawmakers have been on the forefront of the gun safety campaign in Congress. But since the election of Donald Trump to the White House and with GOP control of both houses of Congress, gun control advocates have been on the defensive this year. Congress is now considering a law that would remove restrictions on the sale of gun silencers. The legislation, called the Sportsman Heritage and Recreational Enhancement Act, was delayed by the shooting of House Majority Whip Steve Scalise, a lobbyist and two Capitol Hill police officers in June. But Scalise returned to work last week. If the silencer legislation is approved, it would remove regulations put in place more than 80 years ago. Trump on Monday called the shooting at the Route 91 Harvest Festival concert “an act of pure evil,” but did not mention guns in his statement. He said he prays for the shooting’s victims and encouraged Americans to “stand together in solidarity…especially by giving blood.” But he also did not mention guns. The frustration of Connecticut’s Democratic lawmakers was palpable. DeLauro, and other Connecticut Democrats, are pressing for a ban on assault weapons and high-capacity magazines, and expanded FBI background checks of gun buyers. DeLauro also said Congress should eliminate current obstacles to federal research into the causes of gun violence. Rep. John Larson, D-1st District, said a Quinnipiac poll showed 94 percent of respondents favored broader FBI background checks of gun buyers. How many more tragedies, how many more deaths need to occur until they are finally able to stand up to the NRA and do what is right?” Larson said. Murphy on Monday said he would introduce a new FBI background check bill soon. On the Senate floor late Monday he said Congress’s inaction on gun control “starts to look and feel like complicity” in mass violence. “Because we have done nothing, the mass shootings continue. I know these are harsh words, but I believe it in my heart. I believe there’s an unintentional endorsement that gets sent to these mass murders when slaughter after slaughter, Congress does nothing,” said Murphy. But measures that would tighten federal gun control laws are not expected to be considered in this Congress. Gov. Dannel P.Malloy has ordered all U.S. and state flags in Connecticut to fly at half-staff beginning immediately until sunset on Friday. “Accordingly, since no flag should fly higher than the U.S. flag, all other flags – including state, municipal, corporate, or otherwise – should also be lowered during this same duration of time,” a statement from the governor’s office said. “Do you really want this to happen to your home town?” Malloy asked. Paddock, the suspected shooter, was found dead on the 32nd floor of the Mandalay Bay Resort and Casino. Authorities believe he committed suicide. Recordings of the attack suggested Paddock used an automatic weapon. He was found with more than 10 rifles in his hotel room, authorities said.